Solar Oven Or Solar Cooker? When someone mentions solar cooker or solar cookers, the image that often comes to mind is a box with a glass top and reflectors standing up around the lid. You might have baked chocolate chip cookies in one like that during summer camp. Maybe you even helped construct it using cardboard and aluminum foil. But such a solar oven is just one kind of solar cooking technology. There are different solar ovens and solar cookers: each with its strengths, each with its uses. It turns out that human ingenuity has devised a myriad of designs for cooking with the sun. Here we present two main categories: solar ovens and parabolic solar cookers. Both concepts are based on the same cool idea: to concentrate sunlight onto cookware, produce heat, and prepare food. The big difference is how they concentrate light. Solar ovens are similar to panel cookers, but they use an insulated box to retain heat, along with a set of reflective panels to concentrate solar energy. These insulated boxes are well suited for baking. The sunlight hits the panels and bounces into the box, where the heat gets trapped. Solar ovens can reach temperatures comparable to those of traditional gas and electric ovens (in the region of 400 degrees F). A solar oven is just as easy as your oven in your indoor kitchen. Consider using dark-colored bakeware, which absorbs and retains heat better than light-colored pans and casseroles. Solar ovens are also slow-cookers, as they heat up gradually to baking and roasting temperatures. They are perfect for setting up your meal, forgetting about it for several hours, and coming back to a sumptuous repast. Parabolic solar cookers concentrate sunlight to the cookware, and the most efficient ones generates temperatures over 450 F. They are analogous to traditional stovetop burners and grills, but some solar cookers can heat up faster than traditional stoves. 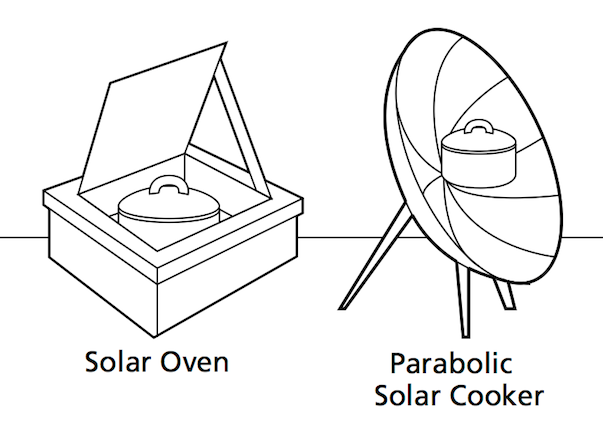 Parabolic solar cookers can cook from just after sunrise until just before sunset even in sub-zero temperatures, as long as they have direct access to the sun. They generate heat by using a curved reflector to concentrate light on the bottom of the cookware, much like a traditional gas or electric burner. The power of a solar cooker’s output is determined by the quality, size, and curvature of the reflector. Because solar cookers heat up so fast and get so hot, they are ideally suited for grilling, boiling, steaming, frying, and sautéing. With a little ingenuity, you can bake and roast as well. See this blog post to learn how to bake bread with the parabolic stove SolSource. Because of the high heat, the rapid cooking, and the movement of the sun across the sky, we recommend you stay near your solar cooker while cooking, just as you would keep a close eye on any high-temperature stovetop cookery. While some types of solar cookers are better for baking and others for stove-top cooking, you don’t have to choose between them. Just like in your indoor kitchen, you have both an oven and a stove–and maybe a toaster oven and a microwave besides. Try designing your own solar kitchen, powered 100% by the sun! Most of our favorite solar chefs combine solar cookers to make a meal, playing on the strengths of each – solar cookers for fast, powerful cooking and solar ovens or panel cookers for slow, gradual cooking. With just a little imagination you can assemble a gourmet multi-course feast without striking a match, burning an ounce of fossil fuel, or emitting any more carbon dioxide than comes out with a laugh! Watch famous Top Chefs putting together a delicious four-course meal, when SolSource Classic was featured on TopChef (Bravo Network, S13, Ep4)!